Jailed Palestinian leader Marwan Barghouti has emerged as one of the most popular candidates ahead of parliamentary elections in January. 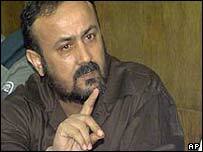 Barghouti came top in a primary poll for the ruling Fatah movement in the West Bank district of Ramallah. He is serving five life terms in an Israeli jail for planning the killing of four Israelis and a Greek monk.